King Dedede throwing a Waddle Dee. King Dedede throwing a Gordo. 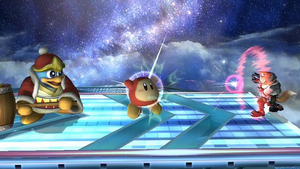 Waddle Dees can be used to protect King Dedede from projectiles. Waddle Dee Toss (ワドルディ投げ, Waddle Dee Throw) is King Dedede's side special move in Super Smash Bros. Brawl. It involves Dedede taking one of his minions and throwing it forwards, which deals damage on impact and is then free to temporarily walk around the stage and possibly cause additional damage. Throwing a third minion will delete the oldest one, while using the move while near a minion (even an opponent's) will pick it up instead of making a new one. Waddle Dees are the most common minion (35/52 chance). They will linger and walk around on the stage after being tossed, and will jump when an opponent is near, dealing 5% damage whenever it contacts the opponent. While a Waddle Dee is on the stage, it can absorb and block any other projectile attack. It also can prevent or hinder some attacks being used as approaches, such as Captain Falcon's Raptor Boost. They can also stop some recovery moves, like Pikachu's Skull Bash. Reflecting a Waddle Dee will temporarily disorient it, but it will return to Dedede's ownership once it enters a new action. Waddle Doos are less common than Dees (10/52 chance). It does 7% with slightly more knockback than a Waddle Dee, and then walks around for a while, sometimes performing its trademark beam attack which can stun an enemy in place for a few seconds. The beam attack is also a powerful attack if it fully connects, dealing around 27% damage. Like a Waddle Dee, it can act as a meatshield and is only temporarily reflectable. Gordos are rare (4/52 chance) and travel with a more horizontal trajectory than the Waddles, dealing a whopping 23% damage with very strong KO power. If it misses, the Gordo will bounce once on the ground, then disappear when it touches the ground again. Unlike Waddle Dees and Waddle Doos, Gordos can be reflected back at Dedede. There is also a 3/52 chance to throw certain items, for example Capsules or Pitfalls, instead of any of the normal minions. If the overall item frequency is set to None, Dedede can still select an item. However, if the items are individually turned off, he will not. A thrown item is functionally identical to one picked up and thrown normally (without moving the control stick), though it can, like the Dees/Doos/Gordos, be slightly angled. The distance and arc that the Waddle Dee/Doo follows and travels can be changed slightly. The distance traveled can be changed if the player smashes the control stick or D-Pad to lengthen it, or shortened if slowly tilt it. The arc affects the distance as well, and can be slightly higher if the control stick or D-Pad is tilted up, and vice versa if tilted down. This is a unique move made for Super Smash Bros., though it's not a very big stretch: Waddle Dees, Waddle Doos, and Gordos are all King Dedede's servants, and King Dedede throwing them around is not out of character at all; evidence of his abuse to his Waddle Dees is present in Kirby's Epic Yarn, where he says "Only I can be mean to my Waddle Dees." The move may also be a reference to Kirby: Squeak Squad, where Dedede throws Kirby (who is similar to a Waddle Dee) with surprising accuracy at the Squeaks, who steal his treasure. If the player uses the Waddle Dee Throw in slow-motion, they can see that he pulls them out of his left sleeve. It should be noted that DOJO!! said it has no idea where it came from, saying it comes from "who-knows-where". If a Gordo hits an opponent's shield at the proper angle, it will continuously travel through the air in a straight path without landing or disappearing until it travels off of the screen. It will not deal any damage, but it will block attacks. Though Waddle Doos can be Inhaled by Kirby, he will not become Beam Kirby, as he would in his own universe. Waddle Dees are impervious to damage from spikes in the Stage Builder. If a Gordo hits a Red Pikmin straight on after it has been thrown, it will bounce off and begin slowly floating backwards until it crosses the blast line. This page was last edited on January 20, 2019, at 19:39.